For more than 35 years, clients have trusted The Law Offices of Stanley Pasternak for personalized and professional legal representation. Mr. Pasternak is a local Toronto lawyer and a respected member of the legal community who will vigorously fight to pursue your claim and to secure the best results possible. Consultations with Mr. Pasternak are always free of charge. Don't be afraid to call him to discuss your concerns. He will personally speak with you, assess your claim and provide you with the best possible advice. Looking for our office? You can find us conveniently located at the corner of Yonge Street and St. Clair Avenue in Toronto. For your convenience, there is direct access to the subway from our location. Have a question for our team? Want to schedule your free consultation? Use the handy eform below to get in touch today. 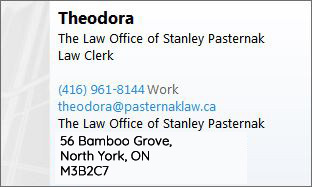 All emails sent through the eform will be redirected to Stanley Pasternak's law clerk, Theodora: theodora@pasternaklaw.ca. Call now for your free consultation with Stanley Pasternak.